Christine Becker House. From Wikipedia. Image by Werewombat, 27 Apr 2009. Classified a Dutch Colonial/Colonial Revival, this home was designed by Emil Schacht and built in 1909.
room, the richest and most detailed spaces within the home. Of all Schacht-designed buildings identified to date, the Christine Becker House is one of only two residential designs known to have enjoyed such publication during Schacht's lifetime. The original drawings for the Becker residence exist. These drawings are located at the University of Oregon, in the Cachot Therkelson Collection, Special Collection Department of the Knight Library. A handwritten note found with the drawings indicates that the cost of the House, including Garage, was $14,060. The Becker residence is sited above street level on a corner lot, at the junction of N.W. 25th Avenue and Pettygrove Street. The floorplan is irregular with a symmetrical front facade facing East. Central stairs lead to the main entrance. The house is set back 22.6 feet from the front lot line. The rear is characterized by an intersecting gambrel roof and various projections from the main volume of the building. The second major facade faces north, and is the location of a side porch which overlooks Wallace Park. Interior detailing of Schacht's residential designs during the height of his career shows a "Craftsman14 influence, with tiled hearths, "art glass", built-in cabinetry, beamed ceilings, and, in his Colonial Revival designs, elegant classical ornamentation [3, page 40]. The Becker home is a superb example of Schacht's Colonial Revival style, incorporating all of these elements. The property is in substantially the original condition. The residence is located at 1331 N.W. 25th Avenue, County of Multnomah, City of Portland, in the State of Oregon. The legal description of the property is Lots 3 & 4, Block 18, in the Goldsmith's addition. Houses and streets were renamed in 1931, and the previous address was 295 25th N. Street. The property comprises the southwest corner of N.W. 25th Avenue and Pettygrove Street, and is located approximately East-Southeast of Chapman Grade School and Wallace Park. The area represents a diverse mix of housing, including apartment buildings and large single family dwellings. Wallace Park is directly adjacent to the Becker residence, and exhibits mature, well kept landscaping; lush lawns and old, deciduous trees. The lot originally sloped south to north, and was filled to be level during construction. Landscaping consists of several ornamental trees and hedges. A lattice fence encloses the large side yard on the southeast. A large old Japanese Maple dominates the northeast corner of the property. The original two-car garage is located behind the house, with a driveway leading up from Pettygrove street. abacus and capital which is diminutive in proportion to the shaft. Turned balusters form a balustrade which spans the perimeter of the porch. A wide frieze and cornice tops the columns. The roof is pierced by paired inset gable dormers which flank a shed roof dormer. A large flower box3 is set between the gabled dormers which have eave returns and paired, single-pane double hung windows. Window groupings on the first floor level consist of a central pane with an art glass transom, flanked by multi-pane side lights. The foundation facing material is also of random coursed Ashlar. The drawings state that this Ashlar was to be "Tenino Blue Stone", a basaltic rock. The main entry door consists of solid quarter sawn oak which reveals beautiful graining. A large art glass panel matching those of the flanking side lights is placed within the door. exposed bracket ends. The porch platform is constructed of Tenino Blue Stone as well. The floor of this porch is surfaced with the same red tile as the front porch. The gable end has close formed eaves, with a frieze board defining the shape of the gambrel roof, and eave returns. level. It is unknown whether the sleeping porch was constructed in this manner.The west facing facade to the north of the sewing rooms has a window grouping in the form of a "T", which reflects the interior arrangement of built-in cabinetry. The windows which make up the "T" are multi-paned. The south elevation consists of the gambrel roof form with a void at the east end; the location of the front porch. Another gambrel roof projects perpendicular to the primary one from the main volume of the house. A frieze defines the line of the gambrel form, and extends horizontally at the projecting side facing gambrel and the void of the front porch. At the first floor level there is a projection from the surface of the wall. This projection has a wide cornice and a window grouping of art glass consisting- of a narrow, horizontal pane, flanked by small square panes. To the west of this projection is an eight-over-one double hung window and further west a window grouping of three, six-over-one windows at the location of the kitchen. At the second story, paired singlepane double hung windows are located directly above the boxed projection. A lunette window, with decorative wood keystone is located at the apex of the gable at the attic story. The original roofing material is suspected to have been red composite shingle, as a scrap piece of such a shingle was recently found between floor joists. Current roofing material is a black composite roof. Exterior walls are built using standard double wall construction with 2x4 studs spaced 16" apart. Interior wall surfaces are wood lath with plaster, and floor joists are massive 2x12's spaced 16" apart. The original wooden shingles of the exterior walls have been replaced with slotted weatherboard synthetic siding by a previous owner(date unknown). The current siding's exposure to the weather is the same as the original siding's, making the change not overly apparent. All other exterior building materials, such as frieze boards, columns, etc. are unaltered and in excellent condition. The main floor windows are of wood, and all original. A variety of single pane, multi-pane, casement and double hung wood windows are used on the main floor. The window art glass is also used extensively for some of the built-in cabinetry inside. Second story windows were originally a combination of wooden multi-pane casement and double hung windows, but were replaced with aluminum double hung windows (date unknown). The original design of the residence called for a "carriage house/garage" combination to be built in the southwest corner of the property. However, it appears that this design was changed prior to construction to accommodate two cars instead, as the structure appears original. The garage's gambrel roof is a miniature copy of the house's main roof, with front facing gable. The front faces north and originally had a set of double french doors, but these have been replaced with modern-style garage doors. All interior walls are ceiled in six inch wide tongue and groove. Multi-pane wood casement windows are present in each of sidewalls. Siding material appears original. A ladder mounted on the inside leads up the the 'attic' story, which has a lunette window, with radiating mullions, located at the apex of the gable. Although the large front porch and pergola create a stately character, the exterior's appearance is modest when compared with the interior of the house. Original drawings of the residence illustrate the design of the interior built-ins, doors, mouldings, arches, coves, wainscoting, beams, columns, mantel, balustrade, banisters, railing and art glass windows. One of the interior detail drawings exhibits a note stating "To be made per sketch", suggesting custom millwork. doors and an art glass transom window above. Boxed beams with a clear grain finish decorate the ceiling. The butler's pantry is located between the dining room and the kitchen in the southwest corner of the house. To the.right of the entry hall an opening spanned by an arch supported by two boxed fluted columns leads into the living room. Flanking each of the columns are fluted pilasters, with the wall space in-between filled by panels.. Facing this opening from the living room the space between the two column/pilaster pairs are finished as bookcases. The living room entrance arch is finely detailed and has a decorative keystone at it's apex. The impressive living room fireplace mantel is supported by four diminutive pilasters of the ionic order. Below the cornice the mantel has a carved egg and dart and bead and reel ornament The fireplace hearth is surfaced with tile. The living room is crowned with a wide cornice and has a coved ceiling. A den is located to the rear of the living room, separated by a pair of paneled oak pocket doors with architrave moulding. Wainscoting in the den is of "selected grain eastern white oak" , and built-in bookcases with double art glass doors have been constructed from the same material. Between the bookshelves is a built-in desk, the working surface slightly tilted toward the front, with a drawer on each side. The desk is also of oak and faces a double multi-pane casement window. Multi-paned French Oak doors, flanked by a pair of multi-paned side lights open out to the north porch with the pergola. The ceiling has oak beams terminating in a wide cornice crowning the room. The remainder of the house's trim is in "grain Oregon fir" . A separate rear hall connects the den to the kitchen and sewing room. A set of stairs leads down from the rear hall to the laundry room of thebasement. The kitchen is generous in size and was quite modern for it's time. It is still largely in original condition. The wood stove and hot-water heater have been replaced with modern gas appliances, but the remainder is fully intact. Large, floor to ceiling built-in cabinets provide ample storage and flank a tiled counter with sink. One of the built-in cabinets has a small screened opening to the outside. Three large double hung windows facing the sink flood the sink area with light. An ironing board is built into the wall and folds out nto the center of the kitchen. A separate "servant's staircase" allows inconspicuous movement between the kitchen and the second floor. A back door with transom window gives way to the back porch, where the Icebox originally stood. The floor of the kitchen is of pine, the only non-oak wood floor in the house, and is currently covered with vinyl tiles4 . The walls have the original mock brick finish which was attained by etching "mortar" joints into the plaster. A servant's bell in an oak housing with room number indicators is installed above the architrave moulding of the door leading into the sewing room. with glass doors line all four walls. Fir countertops offer workspace while base cabinets below offer drawers, shelves, and storage bins. The original copper sink is mounted in one of the countertops. Three bedrooms, a linen closet, the main bath, plus the servant's room are symmetrically arranged around the second story landing. All floors are of oak with similar designs as on the first floor, except for the bathrooms, which have tiled floors and walls. Picture mouldings are present in all spaces, and architrave moulding crowns door frames and built-in closets. Ceiling height on the second floor is eight and a half feet. the drawings which call for a interior wall hiding the roof line and making the room smaller. It appears that these changes were made prior to construction, but without revision of the plans. The trim in the servant's room has been painted, and had originally the same finish as the doors, which still have a clear grain finish today. The intact original main bath is located between the servant's room and the other three bedrooms. The main bathroom walls are tiled, as is the floor. The white wall tile is medium sized and of rectangular shape, while the floor has a smaller off-white octagonal tile. Fixtures are all original and functional. A laundry chute accessible from here allows laundry to be dropped down to the basement. Of the three bedrooms, two occupy the front half of the house. The space between them is occupied by a large linen closet, accessible from the landing, as well as two walk-in closets with sinks, one for each bedroom. The linen closet walls are finished with tongue-and-groove cedar, and have linen shelves. A built-in cabinet provides additional storage. The two large walk-in closets were joined into a master-bathroom5 . The non-bearing wall separating the closets was reduced in length and a perpendicular wall added to divide the space into two smaller closets, one per bedroom, plus a shared master-bath room. A bathtub and a water closet made the conversion of closets to "Master Bathroom" complete. In 1989 the current owners replaced the bathtub with a tile shower, tiled the walls, and replaced the fixtures with new ones. The 1926 tile floor remains, however, and displays an intricate mosaic pattern. All three bedrooms have built-in closets made of fir, some with drawers, and are finished in white. The two front bedrooms each have a door to the "master" bathroom, while the third bedroom has a walk-in closet with sink. The second story trim, doors, and built-ins are all finished in white. The original second floor trim finish remains unknown. All bedrooms, with the exception of the servant quarters, have embellished brass pushbuttons, which allow the activation of the servant's bell in the kitchen. The two front bedrooms each have a six-foot window seat built-in under the sill of the front dormers. The finished basement consists of a fruit room, laundry room, fuel room, boiler room (steam heat boiler), as well as a large, unnamed area. Access to the basement is either by stairs from the main floor's rear hall, or through the external door on the west elevation. The large unnamed area was converted into a studio apartment (date unknown). The remaining rooms are still serving their intended purposes today. The Becker residence has had no structural alterations. Minor remodeling converting the two closets with sinks into smaller closets and a bathroom. The natural finish of the mahogany in the dining room and the oak in the den remain. The remaining trim has been painted, and in the hallway and living room this is known to be the original finish . All the elaborate built-ins, mouldings, fluted pilasters etc. remain in excellent and original condition. This is true for all ten rooms including the kitchen. In 1989 all of the built-up, cracked, blistered, and badly deteriorated paint on the exterior was carefully removed and new primer and paint applied. The original shingle siding was replaced with synthetic siding by a previous owner (date unknown). Exposure to the weather of the newer siding is 9", just like the original siding which was exposed the same amount according to the drawings. All other exterior building materials, such as frieze boards, columns, etc. are unaltered and in excellent condition. The second story wood windows were replaced with aluminum windows (date unknown). restore the original feel of the house as much as possible. • The pergola is currently undergoing a faithful restoration and should be completed in 1991. • The kitchen wood floor will be restored in fall of 1990.
like material. The plans will allow selection of windows with the original number of panes. • A project improving the rear driveway and access to the garage is being planned. • A project building the sleeping porch as depicted on the plans is being contemplated. The two-story Dutch Colonial house designed for Christine Becker, the widow of Rudolph Becker, Sr., by the Portland firm Emil Schacht and Son was built in 1909 and featured in the September 1910 issue of Northwest Architect, a regional building trades journal. The house is located on NW 25th Avenue at Pettygrove in northwest Portland, Oregon and is notably well preserved and maintained. A two-bay garage having a gable-end front and exterior finish work to match the house is an historic and separately-contributing feature at the southwest corner of the generous double lot. The garage has its original shingle siding, although overhead doors are replacements of the original folding doors. The house meets National Register Criterion C as an outstanding example of the work of the German-born Schacht in the American Colonial idiom. Schacht's career in Portland spanned the period 1885 to 1926 and produced a sizable body of work, including over a hundred mid-scale houses in the Arts and Crafts and Colonial Revival styles. The Becker House is rated an outstanding representative of the latter category, a judgement evidently shared by Schacht's contemporaries who selected the house for publication shortly after its construction. feature of the facade is the prominent dormer composed of two gabled dormers with cornice returns linked by a recessed three-bayshed dormer. Original shingle cladding was replaced under a previous ownership by synthetic weatherboard siding but without impact to the character-defining trim detail. Wood window sash are intact on the ground story, but second story windows have replacement aluminum sash. The present owners are considering reversal of the modifications in due course. The Becker House is a competent rendering of the Dutch Colonial style in a residence of moderate scale. It is truly noteworthy, however, for the quality of its interior, which is organized around an especially handsome central reception stairhall in which a column screen and arch order employ boxed fluted Ionic columns and pilasters of the Scamozzi variation wherein volutes of the capital radiate at an angle of 45 degrees. In the dining room an elegant Jugendstil character is expressed in mahogany ceiling beams, high wainscot, built-in buffet cabinetry and transom window. prolific career. At various times throughout this career, he was certainly one of the busiest architects in the state" [3, page 2]. The original plans for the Becker residence are part of the Cachot Therkelson Collection at the University of Oregon. This collection "is primarily a collection of drawings, prints and plans for 269 buildings; the majority in the Portland Area. Approximately 140 of these buildings were designed by Emil Schacht, or Emil Schacht and Son, Architects" [3, page 4]. One of- only two known Schacht residential designs attracting attention from publications of his time, the Becker residence was featured in the November 1910 issue of the Northwest Architect, a "Monthly ' Magazine for the Architects, Builders and Allied Trades of the Pacific Northwest"7.
screened in from public gaze. The living room and spacious hall are furnished in eggshell white enamel, the dining room in South American mahogany and the den in selected grain Eastern white oak. The remainder of the house is in grain Oregon fir.The dining room has beamed ceilings and panel wainscoting. All the ffoors are of hard wood, there is a pressed brick fireplace with a pressed brick and stone-topped outside chimney; the house is heated with a hot water system. Taking it as a whole it is one of the most complete small homes in the city." The Becker residence is used as an illustration in a master's thesis on Schacht's work and style8 . In this thesis, the architect's work is characterized as follows: "Schacht's residential designs in the period 1905 to 1915 fall into two different categories - those influenced by the Arts and Crafts movement and those that continue the Colonial Revival style tradition. Interior detailing of Schacht's residential designs during this period reveal a 'Craftsman' influence, with tiled hearths, 'art glass', built-in cabinetry, 'inglenooks', and beamed ceilings. Many of the Colonial Revival residences have elegant classical ornamentation" [3, page 40]. The Becker residence represents a tour-de-force in this regard, as it possesses all of these elements but the inglenook. The author then uses the Becker residence as the example of a "more traditional version of the Colonial Revival Style", and goes on to say: "This residence is notable for its elegant (and intact) interior detailing", and "While the exterior of the Becker residence is modest and unassuming, the interior is lavish, with finely Grafted classical details [3, page 47]. The Becker home is intact as defined by the seven aspects of integrity: location, design, setting, materials, workmanship, feeling, and association. Design, workmanship, and materials are especially important qualities under Criterion "C". The design of the Becker residence is unaltered, the workmanship superb and fully intact, and the building materials original except for the newer siding, which however still largely conveys the same look as portrayed on the original 1910 photographs. The original siding was replaced by a previous owner (date unknown). Portland9 underwent it's most expansive phase in history during the period 1900 through 1910. The city's population grew from 90,000 to 212,000. This growth surge was due in part to the 1905 Lewis & Clark World's Fair, which gave the city international exposure it had not previously known.Much of this growth was absorbed in today's northwest Portland, an area which had been distinguished by it's stately mansions, owned by many of the city's leading families. However, many of the mansions were replaced in the first two decades of this century by apartment houses. The area became, and remains to this day, an intensely urban concentration of residential, commercial, and institutional uses . This mix of uses has been the source of many conflicting forces over the past decades. Industrial and institutional growth 'chipped-away 1 from the older residential fabric and caused the N.W. neighborhood to evolve to it's present diverse state. 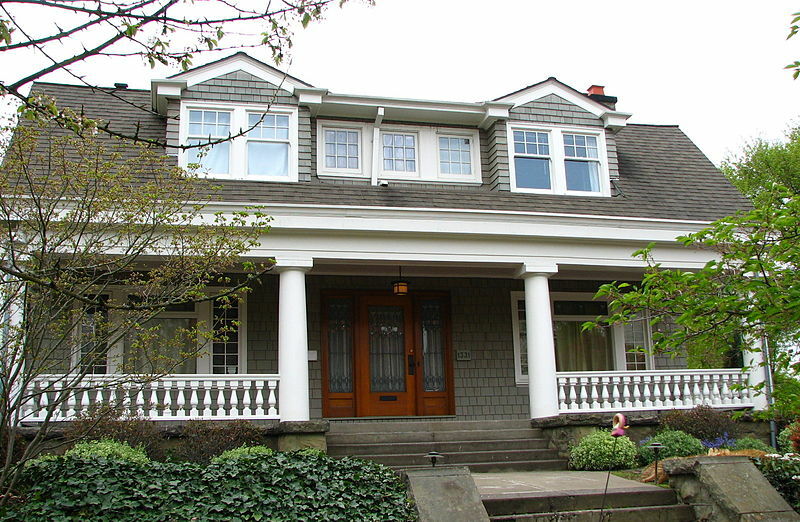 The Dutch Colonial Revival style is extremely rare in Northwest Portland, which is a large area containing hundreds of homes, and is bounded approximately by West Burnside Street in the South, Vaughn Street in the North, Westover Road in the West, and 17th Avenue in the East. A weekend spent searching the neighborhood systematically yielded no other Dutch colonial structure even remotely comparable with the Becker residence. Thus, it is difficult to come up with a list of comparables. Since-the Dutch Colonial Revival style belongs to the Colonial Revival style in general, the Becker Residence must be compared to homes belonging to this larger category. Emit Schacht designed several homes for residents of Northwest Portland 10 . Three Schacht Colonial Revivals designs and one Arts & Crafts design have been identified in the NW Portland area. None of them bear the distinctive gambrel roof form, or have porches similar to those of the Becker Residence. Only one possesses comparable classical interior detailing. 8.3.1. 2374, 2382,2388 N.W. Love joy, built 1905, Colonial Revival Style These three houses all have identical exterior design, and stand next to each other. None are fully intact. On one the front porch columns have been replaced by wrought-iron, another has asbestos siding, the windows have been replaced on the third. These houses were built as speculative homes and are not custom designed. 8.3.2.1234 N.W. 25th, built 1909, Colonial Revival Style This house is just a block south from the Becker residence, was built in the same year, and has received a Rank III rating in the City's Historic Resource Inventory. This former residence serves as a office complex today. Largely intact on the outside, this home had it's small side porch completely removed. The interior is comparatively simple and lacks the rich classical ornamentation. lifetime. The Venness residence received a Rank II in the City's Historic Resource Inventory. 8.3.4.1205 N.W. 25th, built 1906, Arts & Crafts Style Just two blocks from the Becker residence, this 1906 Arts and Crafts is in good exterior condition. Very different from the Colonial Revival residences, it is a good example of Schacht's Arts & Crafts style, and has received a Rank of II in the City's Historic Resource Inventory. 8.4. Emil F. Schacht 1854-1926 Emil Fuerchtegott Schacht11 was born in 1854 in Sommerland, Schleswig-Holstein, Germany. He graduated from the Polytechnic School in Hannover. In 1874, at the age of twenty, Emil Schacht arrived in the United States. He worked in New York as a draftsman for six years, during which time he became familiar with the architectural trends of the late 1870s and the early 1880s, among them the Queen Anne and Shingle styles and the then emerging Colonial Revival style. The architectural trends of this era are the stylistic influences Schacht brought with him when he arrived in Portland several years later in 1883. In 1880, following his tenure as a draftsman in New York, Schacht returned to his native country. He married Auguste Trier on April 5th, 1880. Within several years of his return to Germany Schacht made a decision to leave his home and start a new life in the United States. The Schachts settled in "North Portland" (the area now known as northwest Portland). Schacht's career in Portland from 1885 to 1926 began in the late Victorian period and spanned to the beginnings of the modern era. His body of work exemplifies the architectural styles that were typical throughout the country. Schacht's work continued to follow the trends typical in cities across the United States. After the turn of the century, his work was increasingly influenced by the Arts and Crafts movement. He was also influenced by the freshness of the Craftsman ideals espoused by Gustav Stickiey. During the height of his career, from 1905 to 1913, he was one of the busiest architects of the state. During this period, Schacht received two important commissions for public work in Portland, and several of this projects were published in local and national architectural journals [3, page 79]. Schacht used a wide variety of styles. The building type usually dictated the appropriate style. Schacht also designed simple wood frame structures - modest stores, hotels, and speculative houses that are not generally thought of as architect-designed. Schacht was a leader in the earliest architectural association of Portland: the Portland Association of Architects, for which he served as president in 1907 and 1908. He was also involved in subsequent organizations including the Portland Architectural Club, the Architectural League of the Pacific Coast and the Oregon Chapter of the A.I.A., in which he was a charter member. Emil Schacht's 41 year career as an architect in Portland came to an end March 4th, 1926. Whileinspecting the construction of the Mayer Building which was in process, Emil Schacht collapsed to the ground. It is a fitting testament to Emil Schacht, that he worked until his last day. His death appeared on the front pages of all the local newspapers, and the city mourned the loss of a "well known Portland architect" and "prominent figure in building circles". Christine Becker was born in Germany in about 1852. The exact birth date is unknown 12 . Her Husband, Rudolph Becker, also of Germany, was deceased at the time the Becker residence was built. Their two children, Sophia and Rudolph, were born in Illinois. The Becker's had another home built for them earlier in 1893, at 726 NW 22nd Ave in Portland. They didn't occupied this house, however, and continued living in a more modest home immediately to the south of 726 NW 22nd, while renting the newer structure to Nathan Loeb 13 . These circumstances indicate that they had been in Portland for some time when the Christine Becker residence was constructed. According to deed records, the lot for the Becker residence was purchased in 1908 by Mrs. Becker for $7500 from Mr. and Mrs. Goldsmith, of New York. Final plans are dated 1909 and construction completed in the same year. The 1910 census shows that Mrs. Becker lived at the residence with her two children and her daughter's husband, Claude D. Smith. Also living with them was the housekeeper, Mrs. Lousie Angelking, who was also born in Germany. Mrs. Becker had no profession. seven years after the completion of what was probably her most elaborate residence. Almost all of her investments were in real estate, perhaps not surprisingly, since this was her son-in-law's business. She was a person of considerable means, as her estate was comprised of considerable land holdings, several homes in the King's Second Addition, and many lots in Willamette Heights and other locations. Theestate, of which she named her daughter Sophia the executor, went to her two children.